Minerals are naturally occurring inorganic solids that make up the solid part of most solar terrestrial planets. 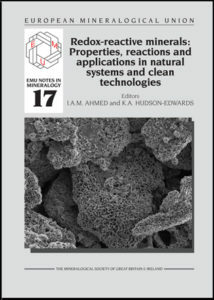 Redox-active elements such as iron, manganese, titanium and sulfur in these minerals allow them to engage in a wide range of electron-transfer reactions including those mediated by biota or processes involved in palaeo-weathering and biogeochemical cycling. The importance of redox-reactive minerals in many natural and industrial processes has been demonstrated by a plethora of scientific publications and industrial applications in recent decades. In this book, the influence of redox-reactive minerals on key biogeochemical processes and opportunities for their application in environmental technologies are outlined and illustrated in 14 comprehensive chapters.